You may have searched in numerous records and databases and not found if an ancestor ever served in the American military. Generally, a male served in the military for some period during their life regardless of state or territory he lived or what time period his life covered. If they really didn’t serve, one major reason would be they were exempt from service. So how did that happen? 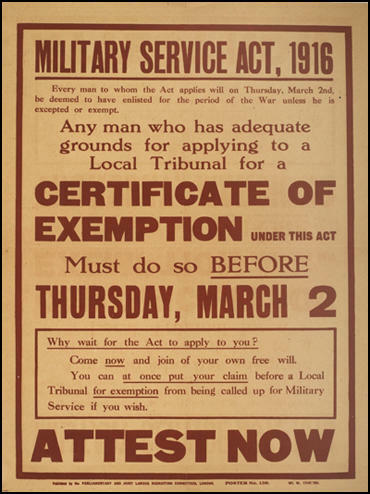 An ancestor could be exempt if his civilian job was considered very important for the war effort. A couple examples would be those men who could repair freight cars, railroad engines or tracks since trains were necessary for transportation of supplies and troops. Also with transportation were those workers in the car and truck industries, they were needed to build vehicles. 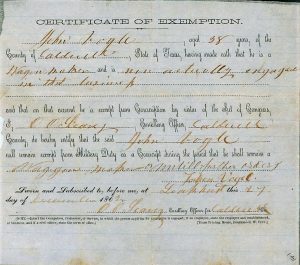 Other exempts (which varied over the decades) would be clergymen, college instructors, a veteran with children under the age of years old, a longshoreman, an ironworker, an engineer, surviving sons or brothers where a parent or sibling had already died in military service, those males who were physically unfit to serve, father only family with children under age 12 years, those serving time in prison, and conscientious objectors (those for moral or religious reasons). 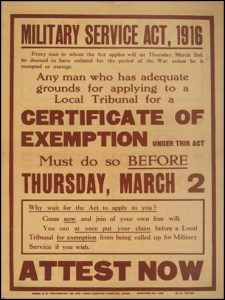 So there are many different exemptions that have applied over the years, some during wartime and some during peacetime. The online site FamilySearch.org has a good selection of military databases for those who did serve in the American military. Check these sources out for your ancestors. Include in that search an ancestor’s brothers (your uncles, great uncles, etc). If not located, there may have been some other reason, such as the exemptions. Recheck some family documents. 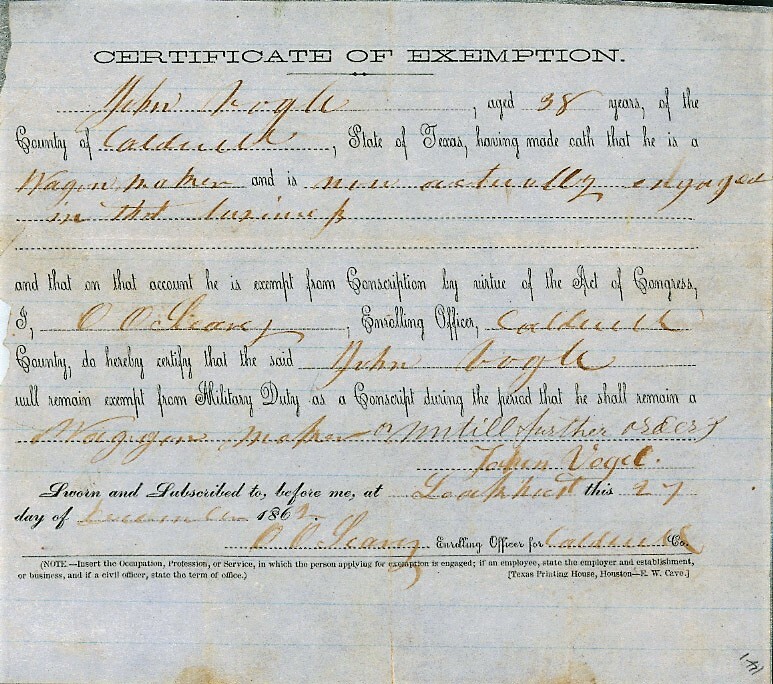 Photos: 1862 Exemption from military service because John Vogel was a necessary wagon maker; a poster of information for those in World War One who wanted to be exempt; and special World War One Exempt Pins.